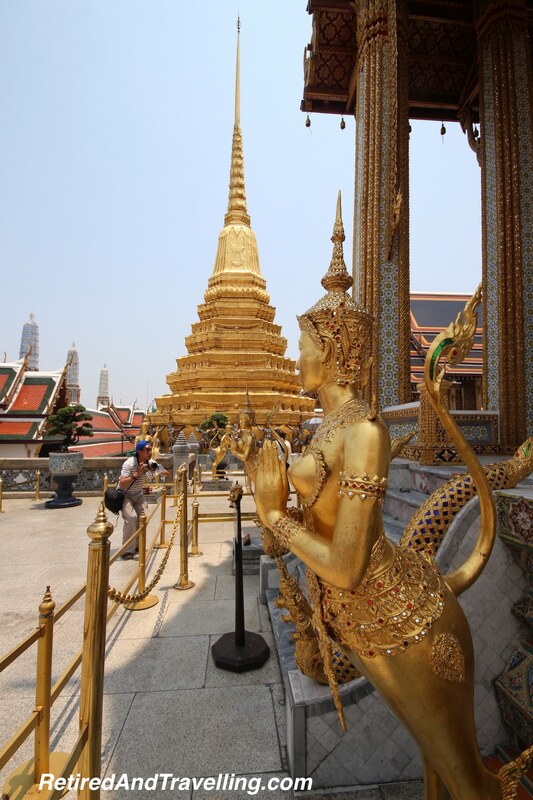 With only two days in Bangkok, prioritizing our plans each day became important. 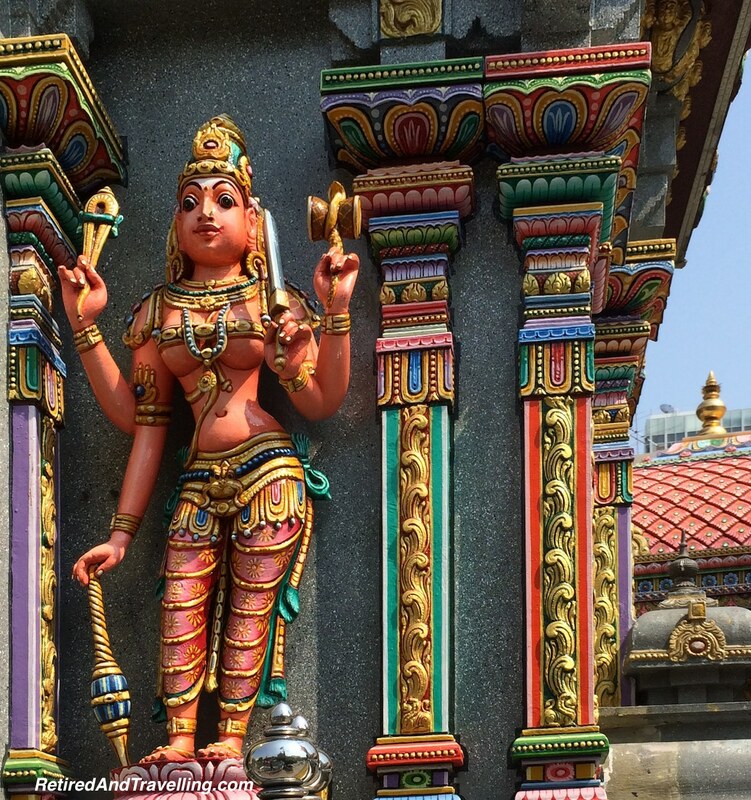 We had really enjoyed our visits to the temples of Bali. 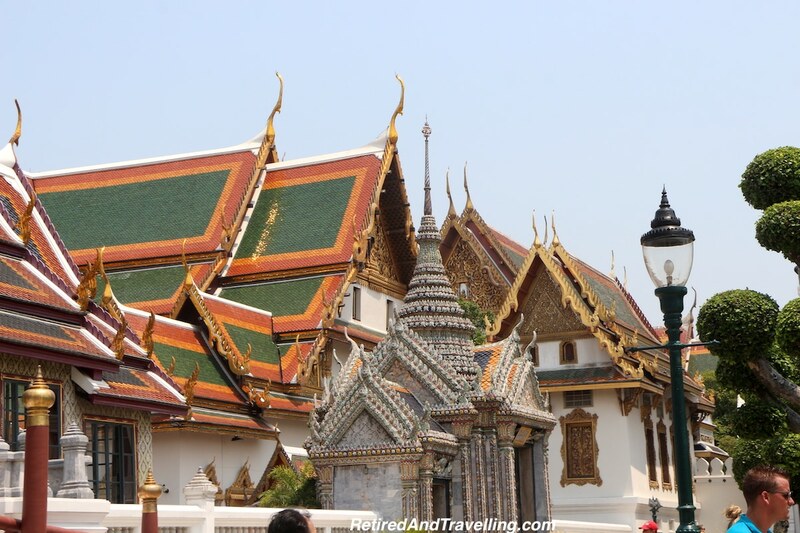 So we really wanted to see a number of the beautiful Bangkok temples. We got just a tease of what we might see when we went past on our night river cruise. Knowing we would not see them all, we started with the top on our list. 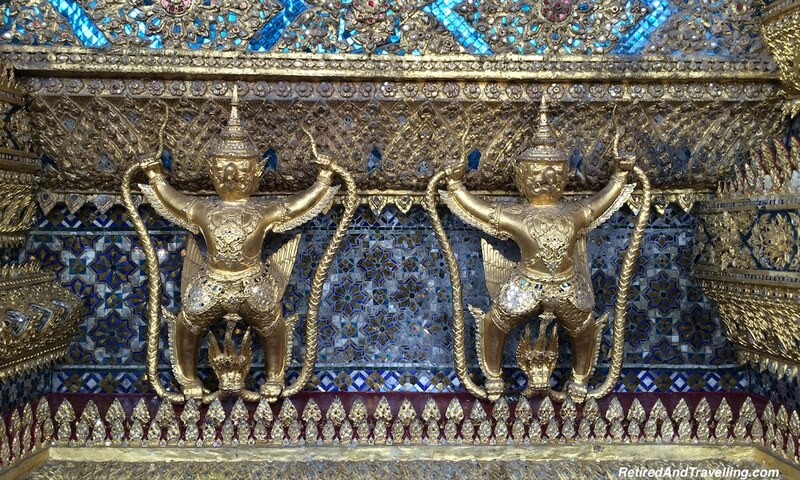 We would be back in Bangkok someday and could continue our tour on the next visit. 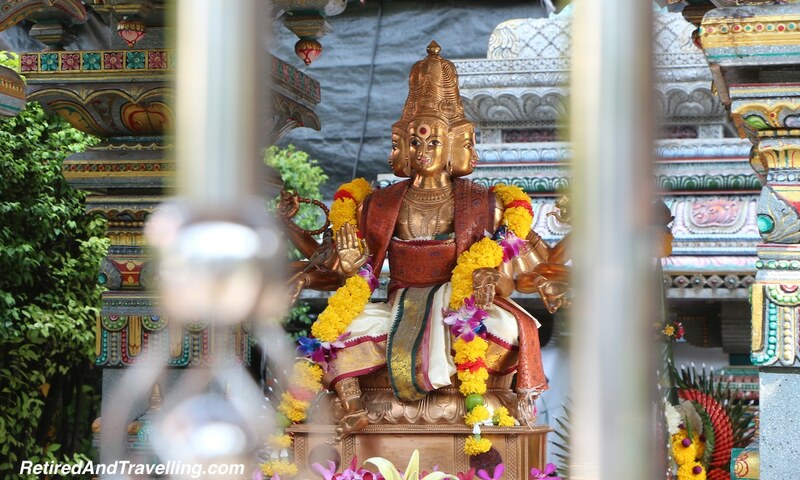 As we had found in our Bali visit, you could find Bangkok temples in private residences and in most commercial spots. Our Holiday Inn Hotel in Silom was no exception. No matter were we walked, we could find yet another statue to the gods. 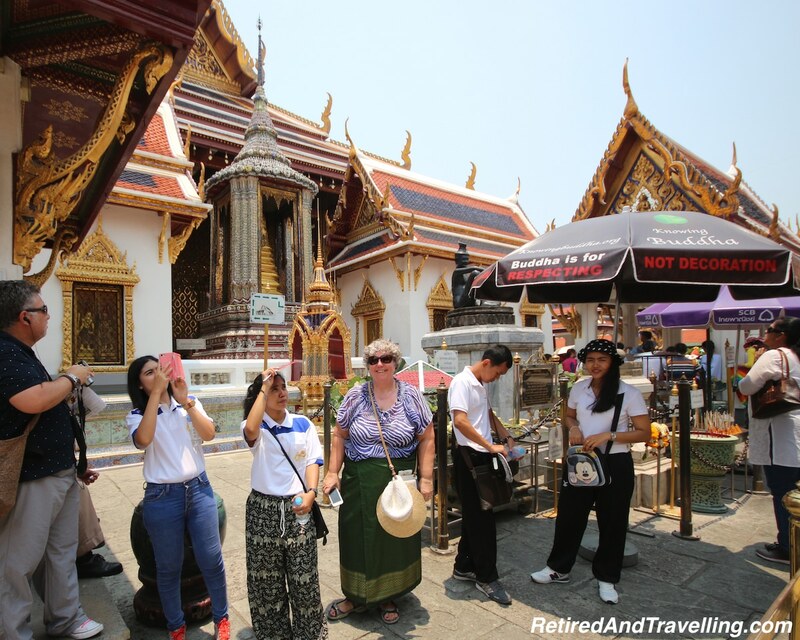 Looking at the map, we thought that we could spend a day and see some of the major Bangkok temples all clustered in one area – the Grand Palace, the Museum of the Emerald Buddha Temple, Wat Pho and Wat Arun. We did not realize how big the grounds were, how much there was to see or how debilitating the heat and humidity would be when we arrived at mid-day. 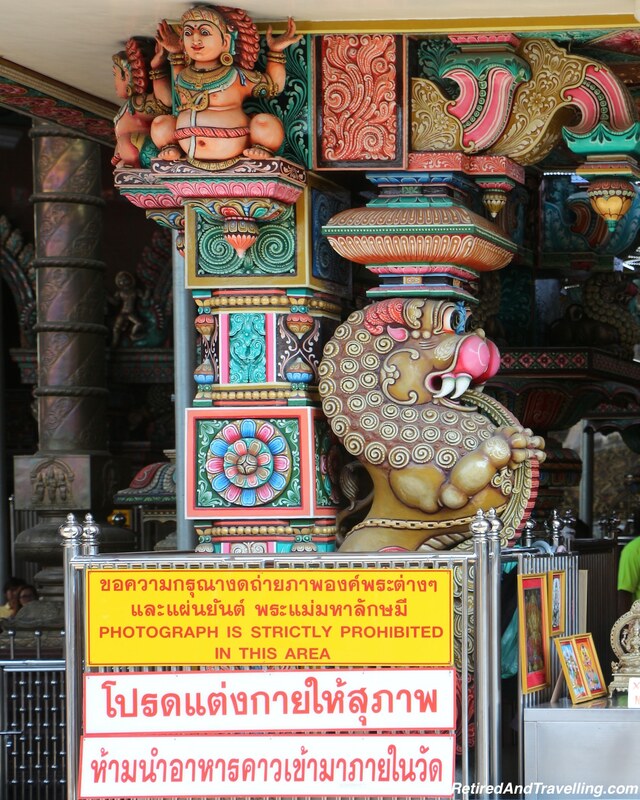 By the end of the day, we had sampled only very little of the Bangkok temples. We started our day full of energy. 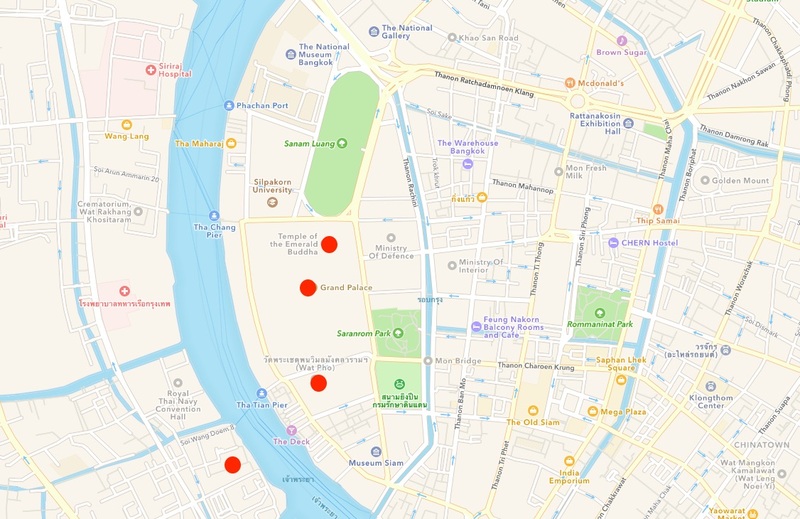 The hotel concierge suggested we make the short walk to the river and catch the local ferry down to the Grand Palace dock to begin our tour of the Bangkok temples. This should have been the shortest and quickest route. As we were walking, a local older man started a conversation with David and said he was heading the way we were. Like the Pied Piper, we followed even when he turned right where we had been directed to turn left. When he suggested it was “just 10 more minutes” to the dock, we became suspicious. Just where were we being taken? When we politely asked again if we were going to the public docks, the man quickly scurried away. We were left to figure out exactly where we are. Certainly we were not on the short and fast path for our ferry. Pulling out my iPhone, I managed to pinpoint us on my offline map app. The first street we followed led us to a dock but it was a private dock where they tried to hustle us for a paid tour of the river. We met a young couple who had been dropped here by cab and stranded. This seems to be one of the common scams in Bangkok. Together with the young couple, we wandered around trying to find the public dock. When we finally thought we were there, the dock turned out to be only for the ferry crossing the river. It had now been 90 minutes of wandering around. 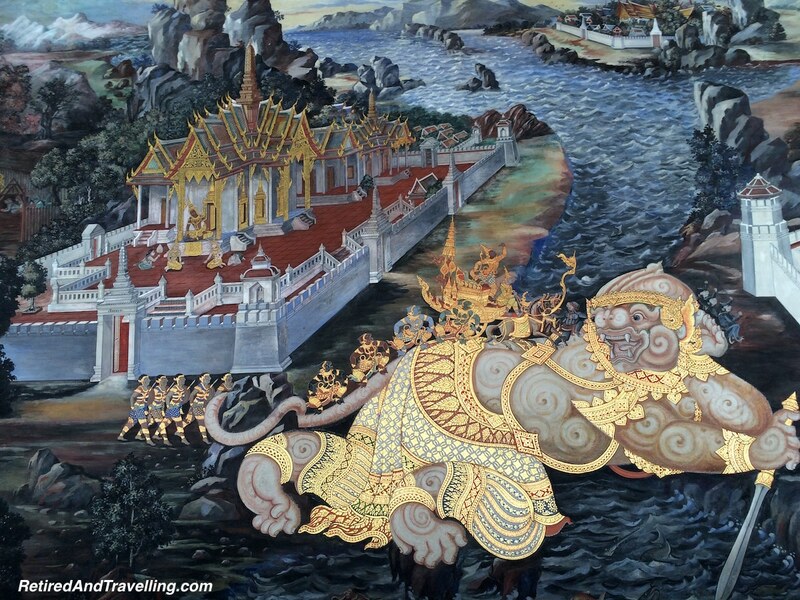 We had yet to start our trip down the river to begin our tour of the Bangkok temples. Frustrated, we all decided to grab a tuk tuk for the ride to the Palace. We piled 4 people into the tuk tuk, shifting around to balance the weight. The driver quoted us 2 prices – 100TBT for a ride with one stop and 200TBT for a direct ride. We all knew to pass on the cheaper ride, knowing that the stop would be at some tailors shop with high pressured sales people. It was still a 30 minute tuk tuk ride. 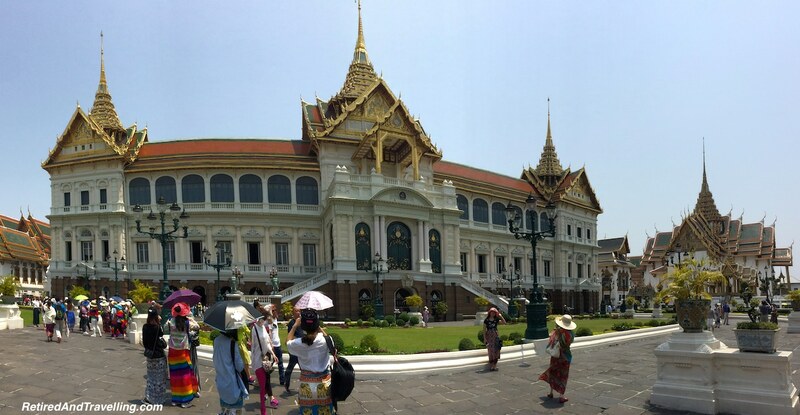 By the time we finally arrived at the Grand Palace, we were already tired and very hot. Not exactly the refreshed state we had started out as several hours ago. 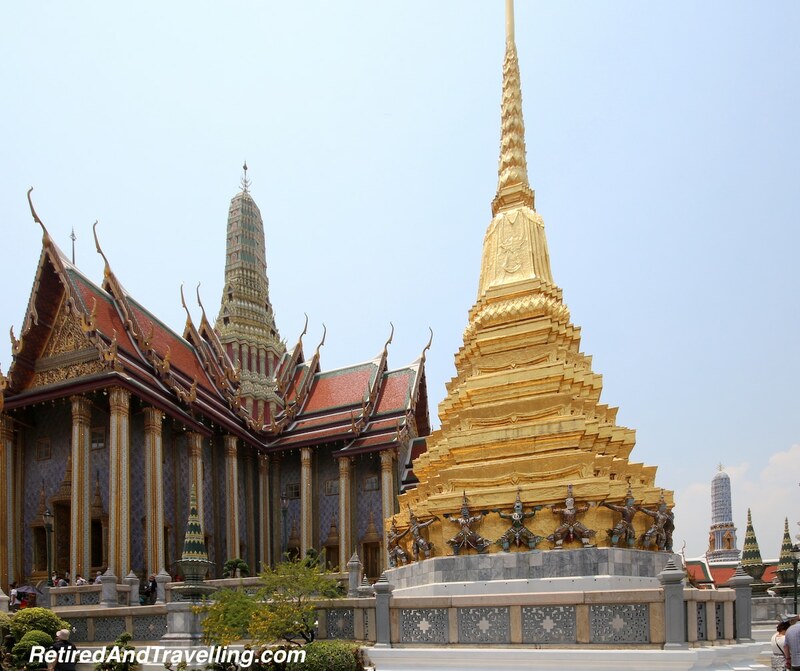 This might be the longest trip ever to get to the Grand Palace grounds! 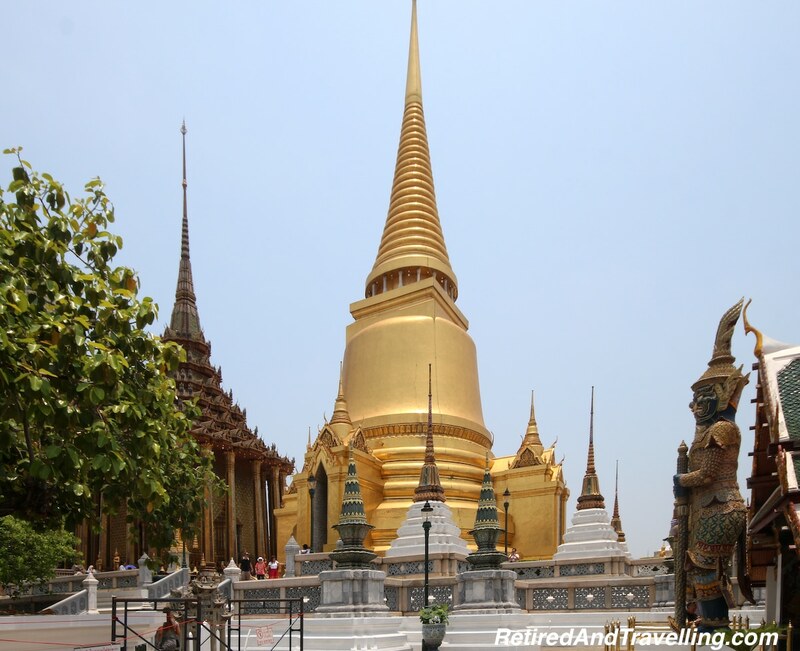 Entering the vast grounds to see the Bangkok temples, we said goodbye to the young couple. We would run into them several times as we walked the grounds. We must have moved at about the same pace since we also caught up to them when we left the grounds. The first stop was to get clothes to properly cover us up. As we had found when visiting the temples of Bali, no visible knees could be showing if you wanted to go inside any of the buildings. You pay a per person fee that is returned to you when you return the clothes. Men were given cotton pants and women sarongs. Needless to say, adding this extra layer of clothes when we were already melting did not add to our comfort level. 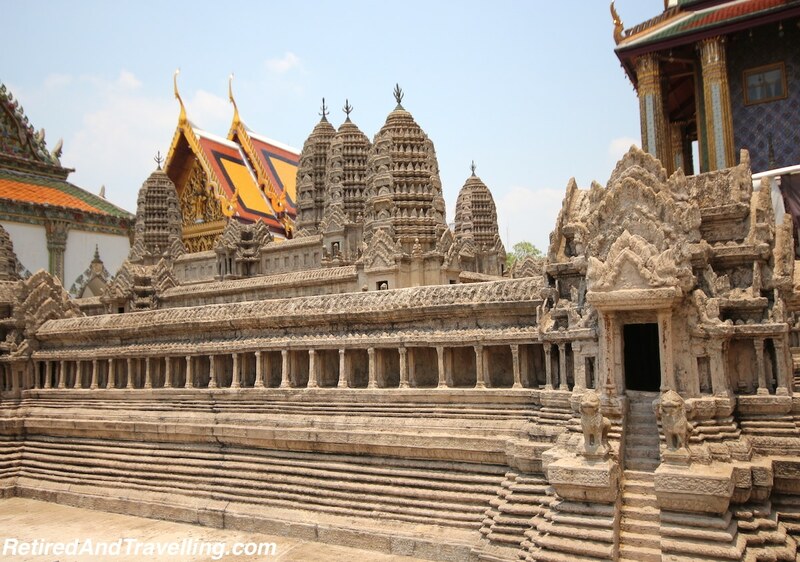 We paid our entrance fee and began our walk around the vast site of Bangkok temples. 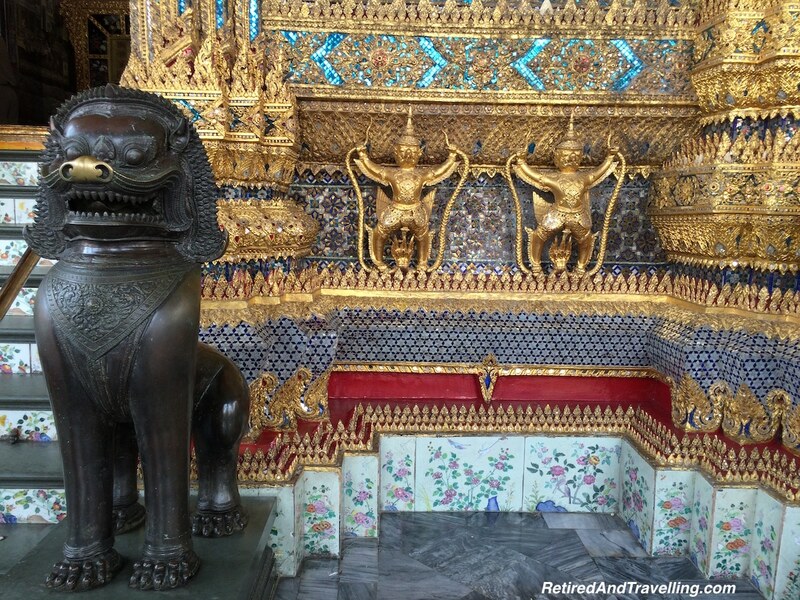 Everywhere you looked there was beauty and so much to see – from decorative building facades to golden statuary. Our heads just swivelled from side to side. 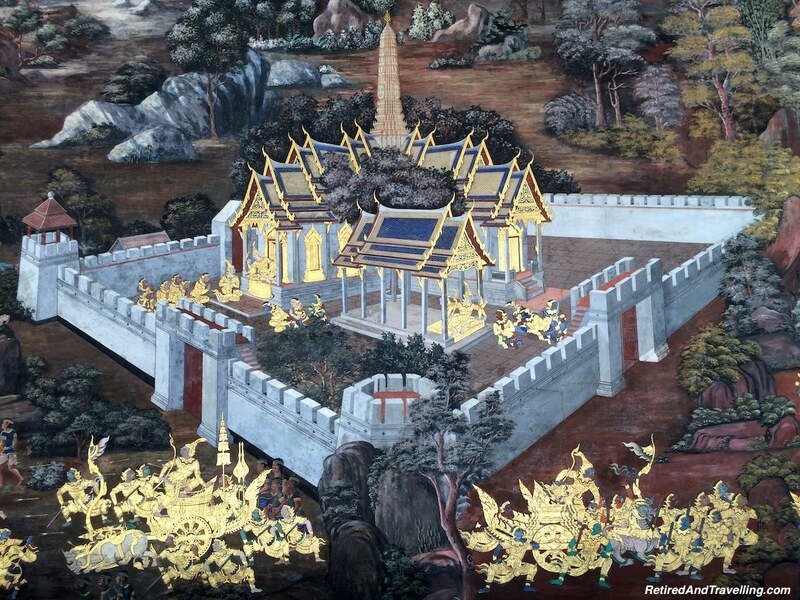 A particularly beautiful detour showed walls covered with detailed story pictures. One of the displays we stopped at was a replica model of Angor Wat in Cambodia. It was amazing to see the level of detail in the model. 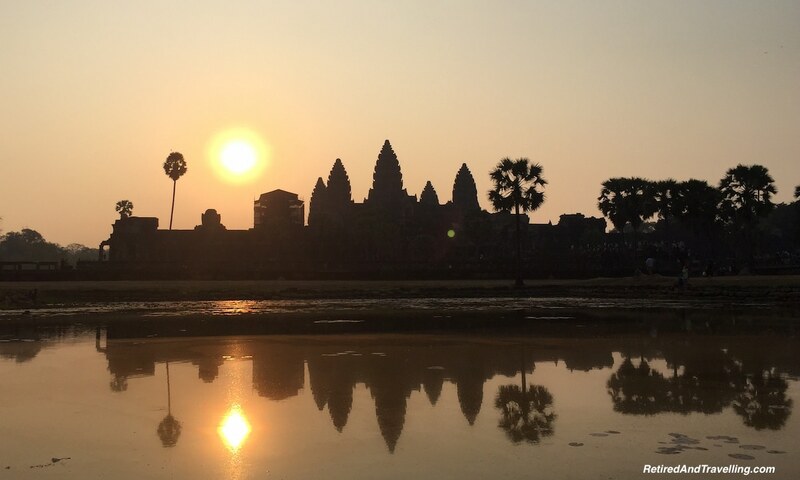 Our travelling son Nick had been there recently so we had an image to match to. It was very hard to figure out exactly where we were inside the complex. Several times we got lost and I had to rely on my offline maps app to point us back in the right direction. There were not a lot of signs and most were unclear. We had thought we would see a large Emerald Buddha on this site. 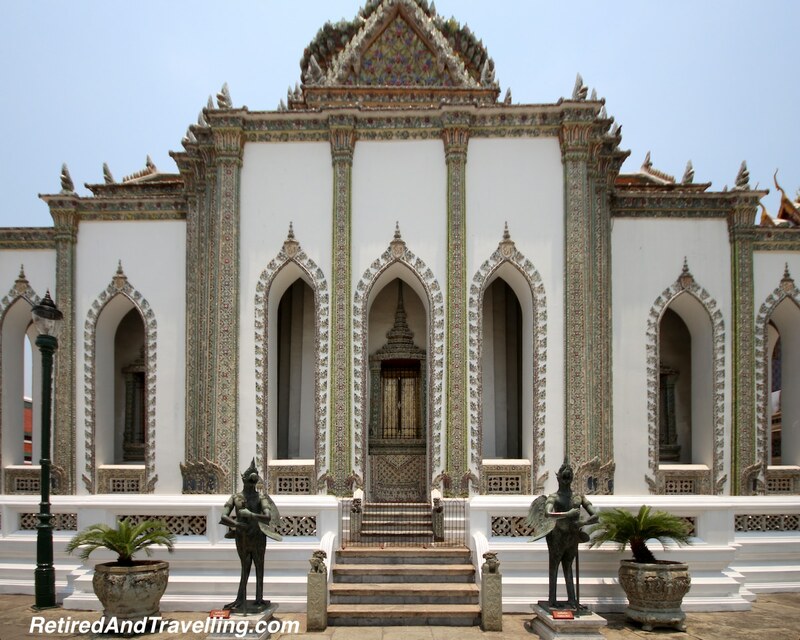 When we finally got to the building marked as the Emerald Buddha Temple, we left our shoes at the door and went in. We found a temple with people on their knees praying and no real way to get close to the altar. 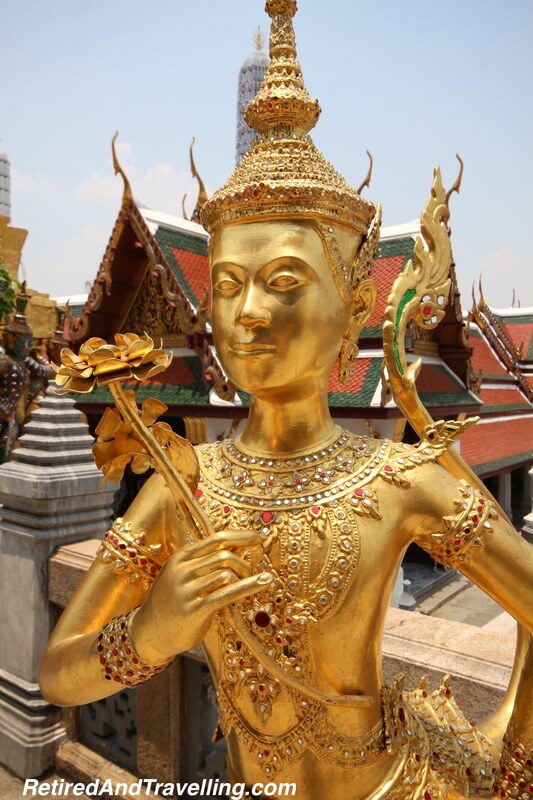 The Emerald Buddha is made of semi-precious green stone (jade or jasper rather than emerald) sitting in a meditating yoga position, clothed in gold and only about 26 inches (66 cm) tall. We were not going to see this from far back in the dark temple and David could not take our his telephoto lens to try to capture a detailed image. 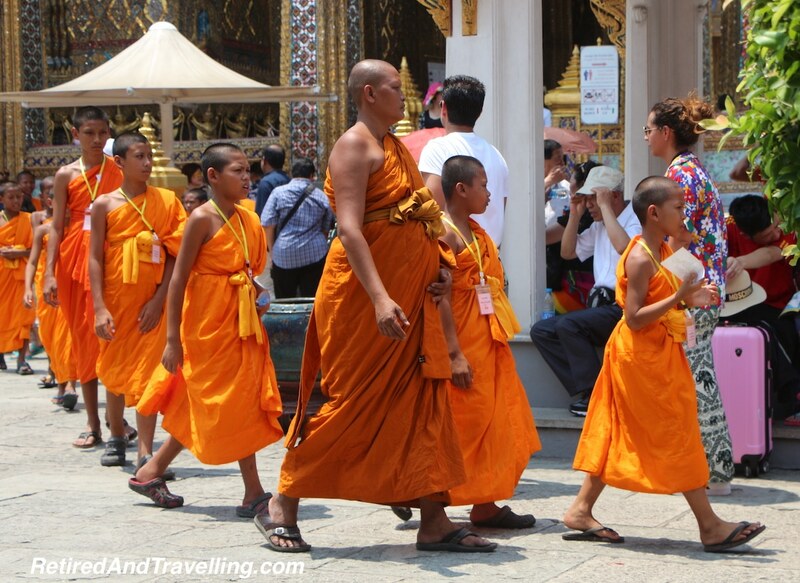 While most of the Bangkok temples site is clearly set up to be a tourist attraction, several times we saw long lines of monks in their traditional garb walking within the site. It was clear that there were parts of this site still devoted to worship. As we walked around the awesome buildings we thought we were in the Palace until we found a sign pointing to the Palace. Yet more interesting buildings lined the path to the Palace. When we finally reached the Palace, we had no energy left and could only admire the Palace from the outside. I am sure we were not the only ones who got sidetracked by the rest of the beautiful site before they hit the much less impressive Palace building. We called uncle for the day. After several attempts, we found the exit and returned our borrowed clothes. I was not going to attempt to find the ferry to return down the river and I was not taking an open tuk tuk. 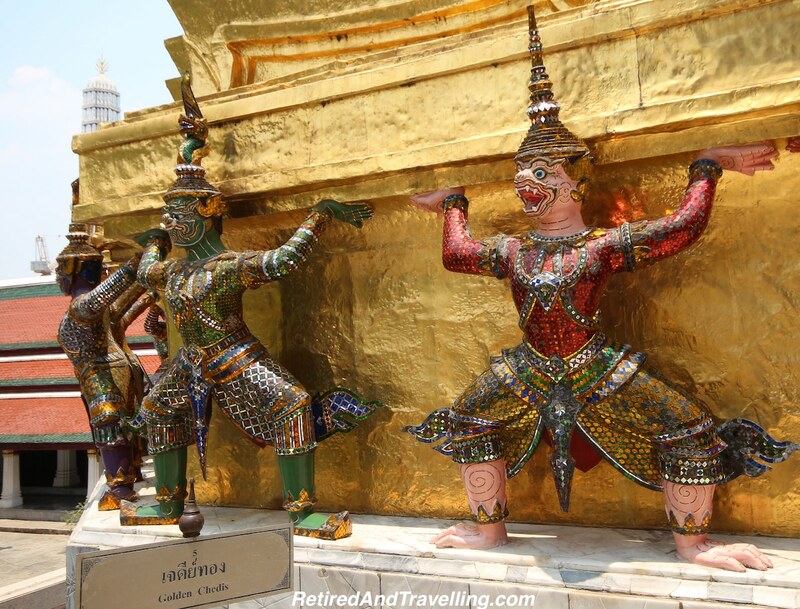 The taxi drivers were just waiting for exhausted hot tourists like us dragging after a visit to the Bangkok temples. They refused to run the meter and the opening bid for a fixed price was more than highway robbery. We finally settled on a high price because I really just wanted to get back to the hotel. 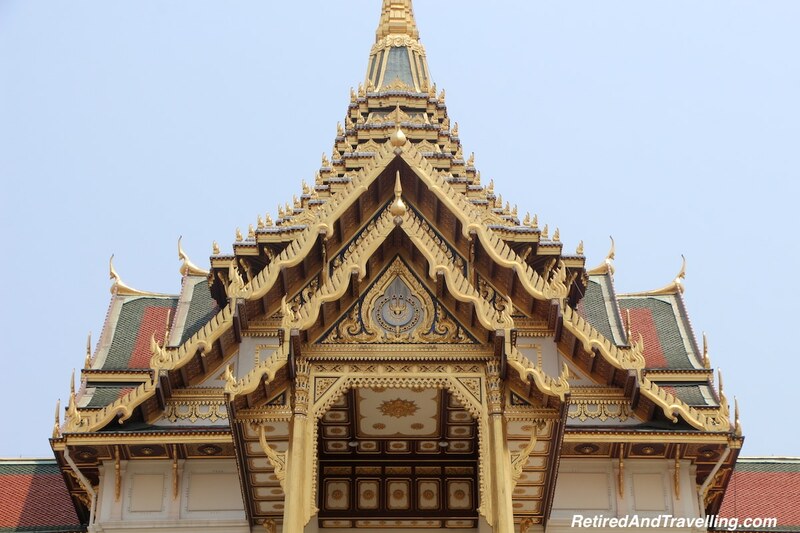 If you plan to visit the Palace and the other Bangkok temples in that area, plan to get there early and refreshed. There is a lot to see and the heat settled in as the day went on. Plan your route in advance and pick up a site map. You may also want to consider hiring a guide. But if you do, make sure you advise the guide about what you want to see so you will get through your list before you are ready to call it quits. The site is amazing with so much to see. Don’t be surprised if you need more than one visit to really enjoy it all. 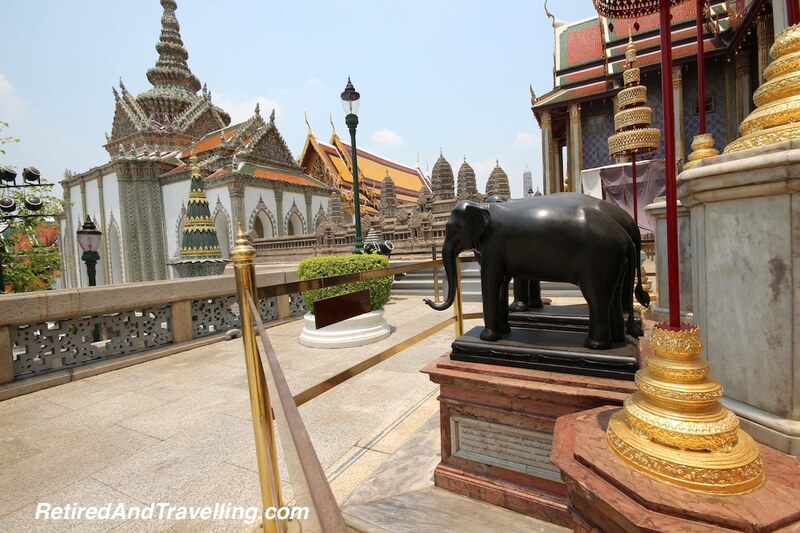 We were disappointed to have missed Wat Pho since it was on the same side of the river as the Palace and Temple of the Emerald Buddha. Wat Arun required a ferry ride across the river. Given our lack of luck with ferries that day, even if we had not been exhausted, we were not trying to find a ferry dock. 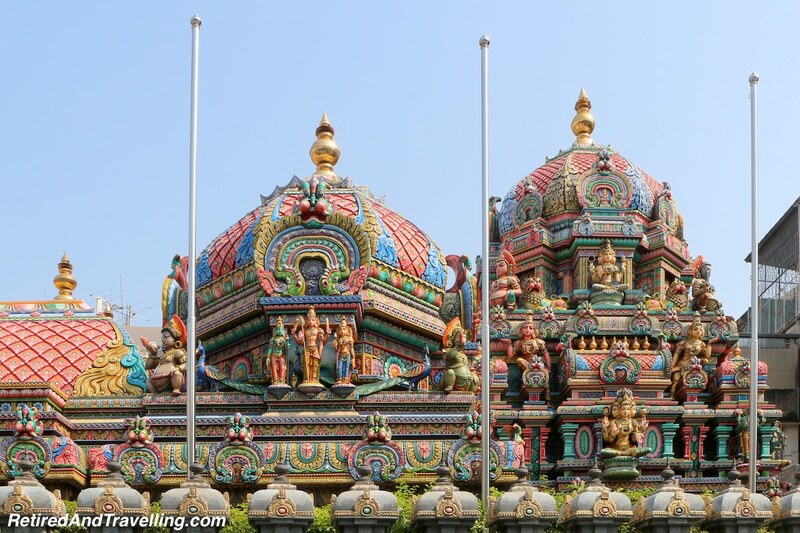 The Sri Mahamariamman Temple was one of the other Bangkok temples that was on our list during our travels in Bangkok by day. 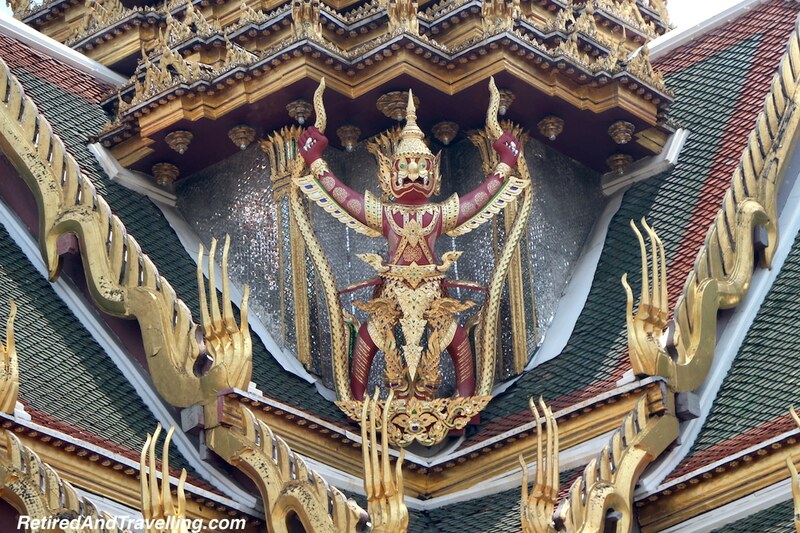 This is the main Hindu temple in Bangkok. This temple was only a short walk from our hotel. 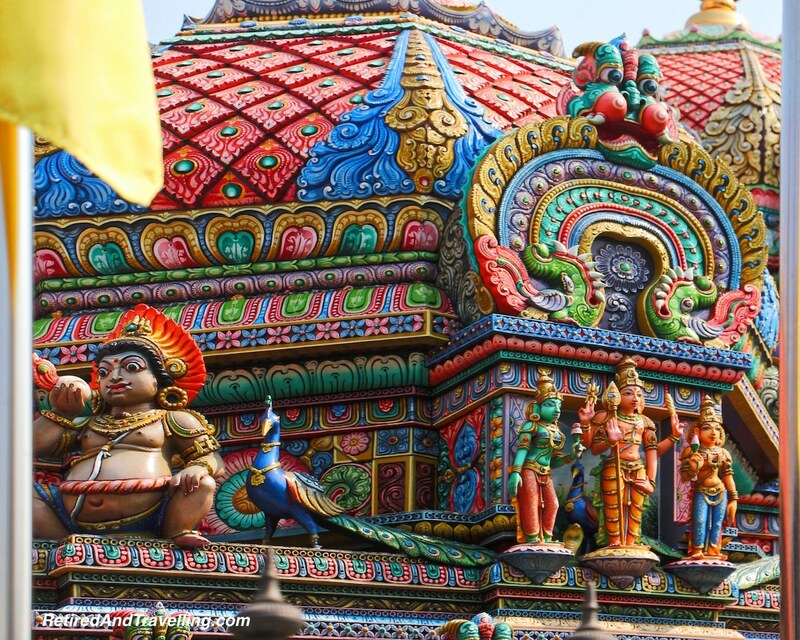 From the street you could see the very colourful and decorative temple. 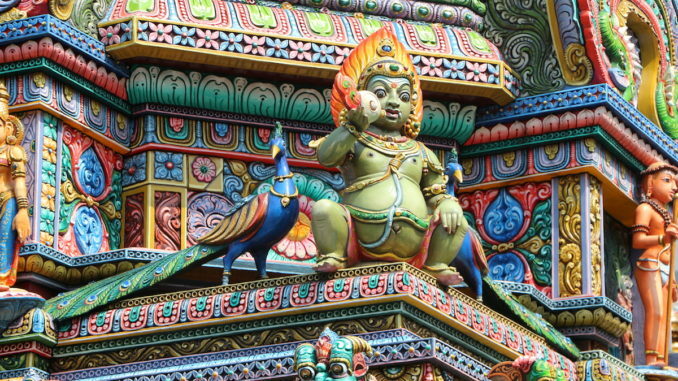 This temple was much more colourful than the temples at the Palace. 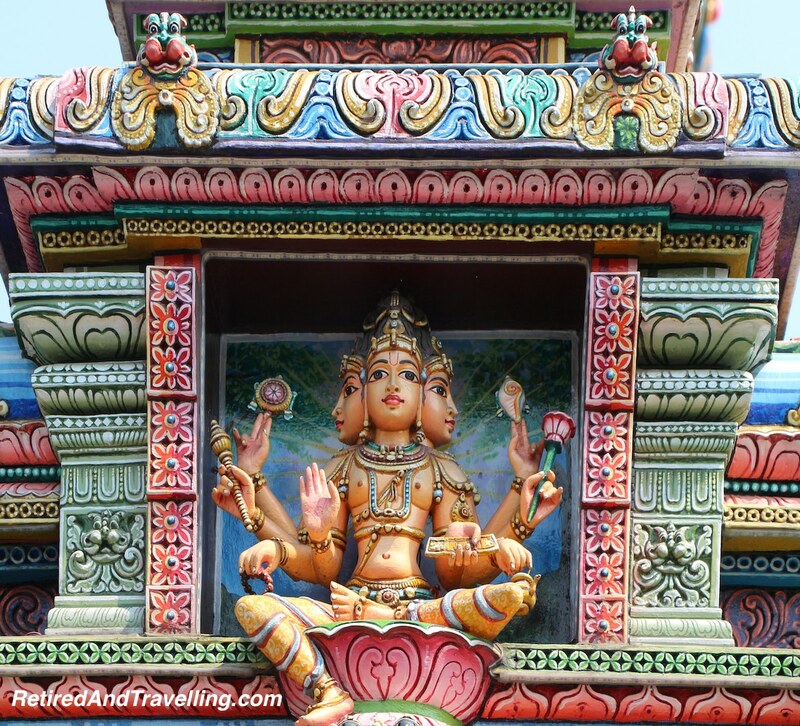 It was covered with carved images of various gods and goddesses in different shapes and sizes. We walked around all side of the temple from the outside and snapped our pictures. We knew that cameras were not allowed inside the temple. 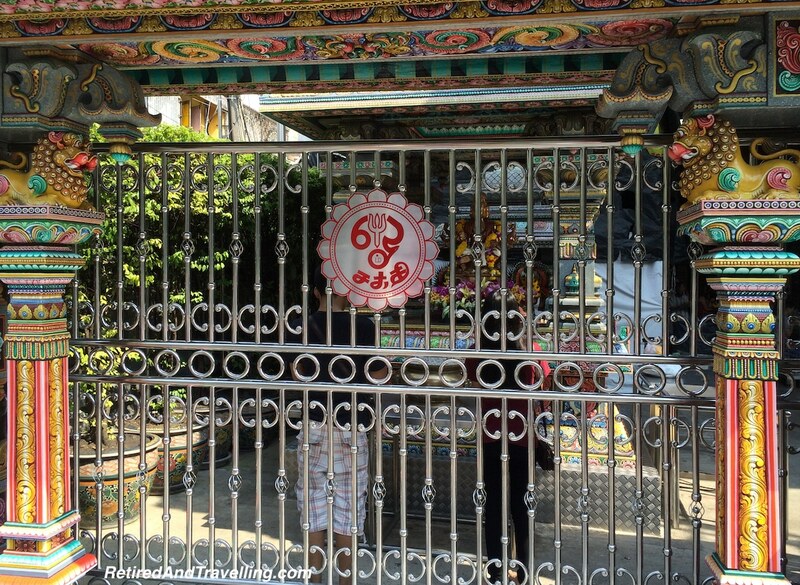 When you entered the temple, it was immediately obvious that this was a working temple. 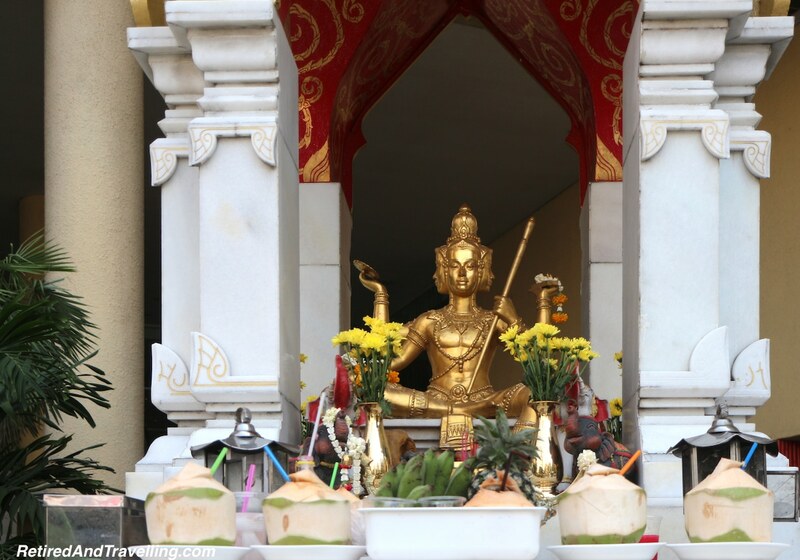 Daily worships are attended by a large number of Thai Buddhists and Chinese who believe that Hindu gods help them in business and bless their women to conceive. 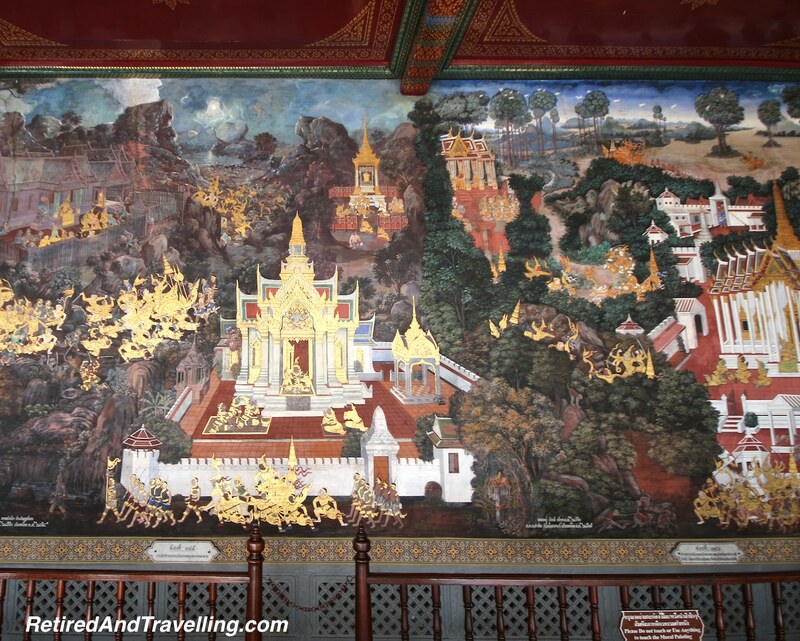 There were some tourists visiting this temple but not the bus loads we had found at the Palace temples. People kneeled at the main alter with their offerings and then headed to a number of specialized alters off to the sides. 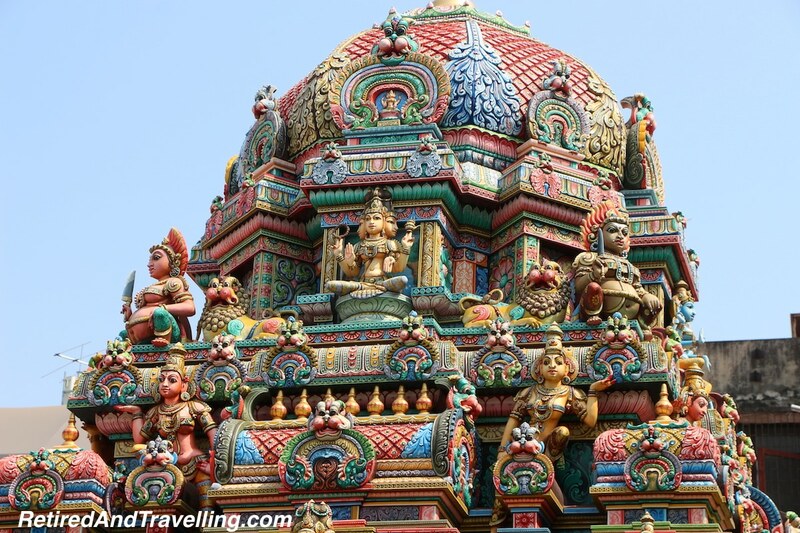 There are 3 shrines dedicated to Ganesh, Kartik and the main shrine of Sri Maha Mariamman. 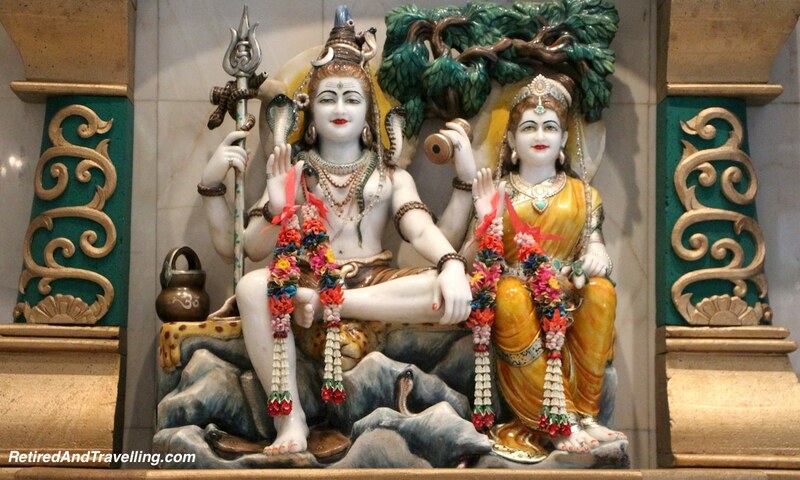 Shrines were also dedicated to the worship of gods Shiva, Brahma and Vishnu. 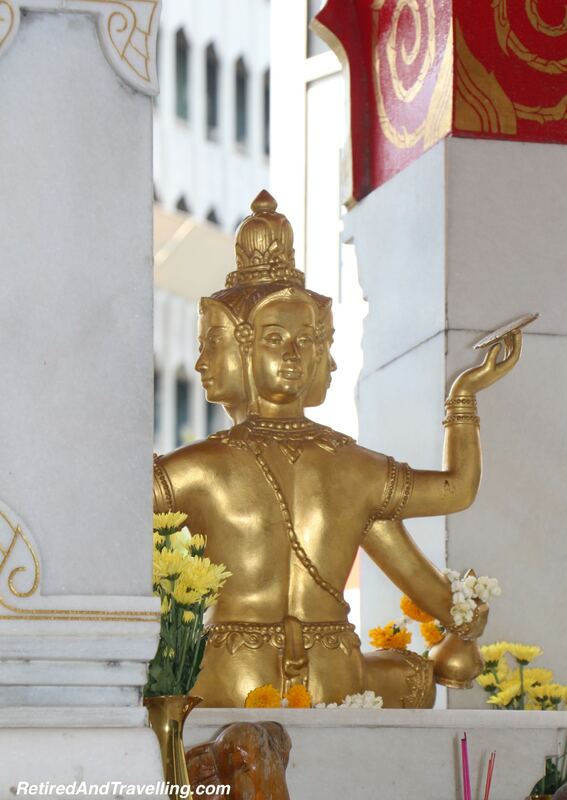 Offerings could be picked up from a street vendor before entering the temple. If you didn’t come with an offering, you could purchase one inside the temple. 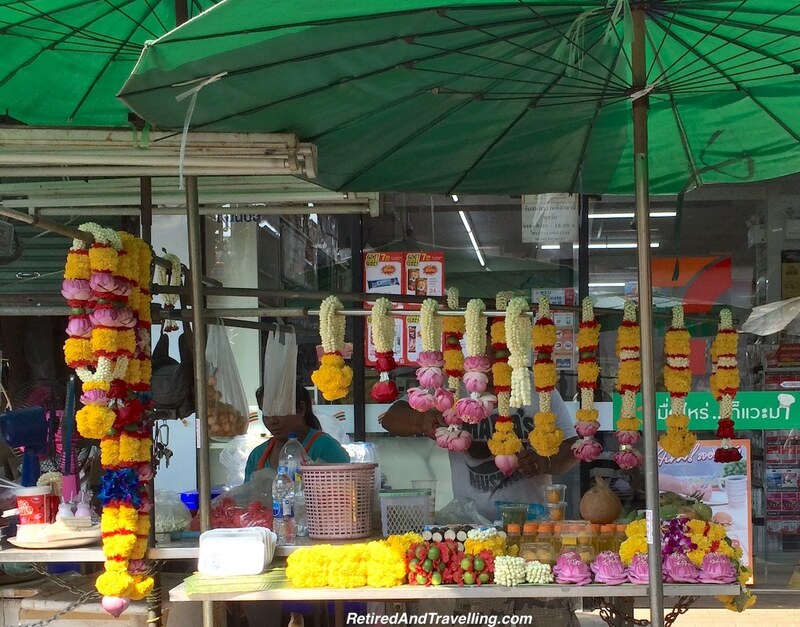 The standard offering includes a garland of flowers and fruit. The ones we saw included a bottle of water and a small bottle of what looked like oil with a candle and some sticks to light. Taking off our shoes, we walked into the temple and found a spot where we could respectfully watch the ceremony of worship. There was a steady stream of temple visitors at the main alter with their offerings. You could see many of them mouthing their prayers as the constant chanting echoed through the temple. It was great to visit this temple and see the devotion of the visitors in this beautiful temple in the heart of the Silom area. 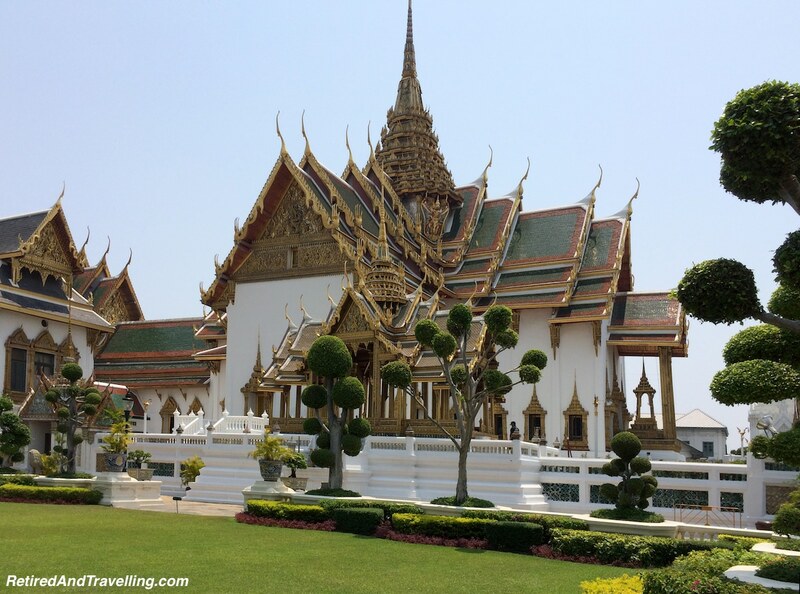 It was great to spend some of our days in Bangkok getting a glimpse into the Bangkok temples. These beautiful and artistic venues for worship are open for tourists to respectfully share. 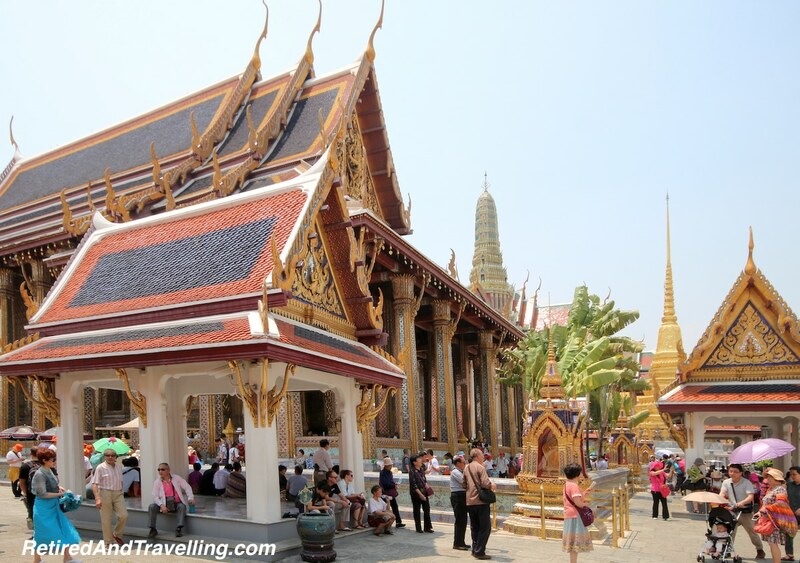 Did you visit the Bangkok temples? Which was your favourite site? Do you have any tips on how to maximize your temple visits?